Here is a top I made a few months ago, after the Cyclamen Top. It is the same pattern – New Look 6470, this time with bell sleeves. 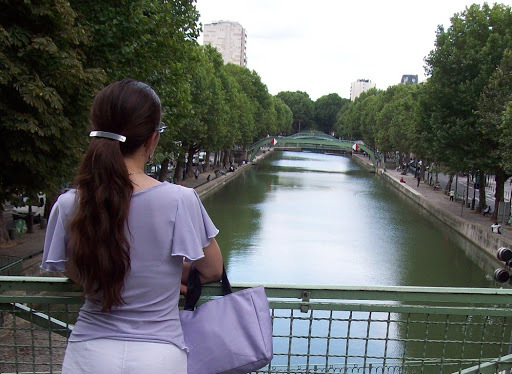 This is the Canal Saint-Martin… One of my favourite spots in Paris. I like so get the without a computer trying to be patient thing…cause I NEVER am! *LOL* Hope your computer problems are resolved quickly!BTW, the top is adorable! Lovely top and lovely scenery. Regarding the lace top – it doesn’t matter that it is a junior’s pattern, what matters is that it fits and that you love the garment. I’m sure you will be quite beautiful in it! Hi Isabelle, so nice to be seeing more of you! Your tops are so lovely-I wish I could sew too. So pretty and delicate without being childish. I love it. Love the “bell sleeves” they are so pretty. Lovely top, Isabelle! you look gorgeous!I suppose you’re back to work…How is it going?take care. Wonderfull. I love the bell arms – they are so romantic (especially with the wonderull background). I’m looking forward to see what you created with the lace blouse pattern. This is a very pretty piece. I love the blouse with the bell sleeves. This type of sleeve suits me very well and is also very easy to move around with an active lifestyle. I love the lace blouse too. I have only worked with lace in regards to doll clothes, so perhaps it would be easier to make something in “human size”! What a lovely top! The fluttery sleeves make it perfect. I love the shirt, it’s so romantic yet not Renaissance fair! Such a beautiful top, the fabric is fantastic! Your new top looks beautiful! Great scenery.I think the new pattern you bought will be great. Who cares that it is a junior pattern. I think it is “adult” enough for sure. Hello ma chère Isabelle !Ton top parme est très joli, j’aime beaucoup les manches …Quant à ton nouveau projet … tu ne l’aurais pas dit, je ne me serais jamais doutée que c’était pour les jeunes filles … ça a l’air très joli.Gros bisous et caresse à la minette. Dearest friend, this is another gorgeous top that enhances your beauty! You’ve been busy! That pattern is lovely. I think a junior pattern would be a perfect size for you. I wish they still fit me. Somehow when we age, even though our measurements may not be that different, the proportions are all different, at least that’s the case for me – sadly.